At least once a year I make my annual pilgrimage to my favorite city in the world: Paris. Something about Paris keeps me coming back. Perhaps its the small cobblestone streets strewn with boulangeries, cafés, and markets. And the people who seem to understand the balance of life, and who choose to savor their meals and experiences. It's the history which is written on every building, and the architecture which is grand and stately. I love that I can walk the same path ten times, and still somehow every time I stumble upon something new, or some small side street with a hidden gem. I love that Paris is big and it's easy to get lost in the shuffle, but it's also easy to find a neighborhood and get comfortable there. I feel invigorated when I am there, and I love the ability to explore and try new restaurants. Paris has always been a culinary destination, but as food and travel writer Lindsey Tramuta talks about in her book The New Paris, the food scene is exploding with new coffee shops and modern versions of the classic brasseries that line the streets in the City of Light. This past trip gave me the opportunity to dig in, check out new neighborhoods, and enjoy the evolving restaurant culture of Paris. April is a beautiful time to visit Paris, but then again... Paris is always a good idea no matter what time of year. The big open space with pebbled paths, fountains, benches, and flowers makes for a great afternoon or evening stroll. I recommend picking up a croissant or loaf of bread and bringing it with you for a snack while exploring the gardens. The coffee scene in Paris is changing rapidly, and the influence of Americans and Australians has introduced "grab and go" coffee, which used to be hard to find in Paris. Check out Ten Belles, Le Peloton, Coutume Café and Ob-La-Di to get started. Someone has to do it! I'd suggest trying Du Pain et des Idées, Des Gâteaux et du Pain, and Pain Pain. Also, please report back on any important research and findings. It was closed for years as the Ritz was undergoing renovations, and it recently reopened in the beautiful Place Vendôme. It's a tiny space, but it's full of swank and great service. The drinks are very expensive, but it's definitely worth it to enjoy a cocktail surrounded by Hemingway paraphernalia and in the same space that used to be frequented by Cole Porter and F. Scott Fitzgerald. After years of visiting Paris, I had never actually been inside of the Opera House. On this past trip I took a self-guided tour inside the ornate and impressive palace, and wow is it a stunner! While I wish I had booked a ticket in advance for a formal tour, I was lucky enough to enter at a time where they were holding a ballet practice so I was able to catch a sneak peek. I'd highly recommend checking this out if you can, and I will definitely plan ahead next time. There is just no other place like it. The Tuileries are one of my favorite parts of Paris, mainly because it proves that beautiful, open, green spaces can exist in the middle of cities. I love to go and grab one of the green chairs right in front of the fountain and plant myself in the sun for awhile. The flowers are stunning, and the buildings are magical with the Louvre flanked at one end and Place de la Concorde at the other side. I wouldn't bother dining at any of the restaurants, but it's a great place to bring in your own picnic and to enjoy the sights of Paris. For years I had passed the Arc and wondered what the view would be from the top. I've now climbed up there twice in the last year, and it provides a pretty magnificent perspective. You need to find one of the underground entrances off of the Champs Elysses to get to the base of the Arc in the middle of the traffic circle. From there you can purchase tickets and climb the steep 40+ steps to the top. It's a narrow and winding circular staircase, but the fresh air and view from the top makes it worth it. No matter how many times I see it, it's still magical. And it is particularly magical when it sparkles and twinkles at night. The area tends to be less crowded in the evening, yet you're almost certain to find musicians and other interesting characters during a nighttime visit to the Eiffel Tower. The lights twinkle for five whole minutes every evening on the hour, so make sure to arrive at the right time in order to enjoy the show. I have now taken three different classes via La Cuisine Paris and I continue to book with them every time I am in town. First a croissant class, then a soufflé class, and on this trip I took the Gastronomy Les Halles food tour which was excellent. I loved meeting our tour guide at the famous kitchen supply store, E. Dehillerin and then making our way through town to visit the best cheese, bread, and charcuterie shops along Rue Montorgueil. We ended the food tour with a meal back at the cooking school including delicious wine. I am always amazed by the amount of families and children hanging out in this famous square in the Marais. It's a public space that is filled with local Parisians, many of whom live in the area and love to enjoy their local park. There are kids digging in sandboxes, students sitting out on picnic blankets, and people sitting on park benches reading books. It's a great spot for a break, some sun, and some great people watching. I love this courtyard! It's in a busy and bustling neighborhood, but walking into this square muffles the loud streets and provides a sense of calm. There are black and white striped columns that allow people to stand upon, and also gorgeously manicured tree-lined walkways. If you're looking to enjoy modern art in Paris, then this is the spot for you. The museum includes works by Duchamp, Warhol, Rothko, Pollock, and more. In addition, there is a stunning rooftop bar which provides a gorgeous view of the Marais/Les Halles neighborhood. This April marked one year since I had been in Paris last. I try to go every 6 months, but my trip to Australia in late 2016 caused my delay this time around. On this trip I went back to a few old favorites, but I also tried a bunch of new spots that are worth highlighting. I would note that reservations are highly recommended in Paris, so do your best to plot out your eating plans in advance of your trip to ensure you get to enjoy the spots you've been dying to try. After years of hearing about this famous crepe and galette spot in the Marais, I finally scored a reservation for brunch. I wouldn't recommend just showing up, because the place is always sporting a very long line out the door. My friends and I split some savory galettes with ham, egg, and Gruyère as well as a sweet crepe with nutella and banana. Everything was good and satisfying, but I can't say that I'll be rushing to go back. It's definitely an institution, it just didn't wow me. Breizh Cafe is located in the Marais at 109 Rue Vieille du Temple. I can't think of a restaurant that has charmed me more than Buvette in a long time. The minute I walked in, I had a smile on my face. The space is tiny and inviting, and is nestled on a long and winding street in the Pigalle neighborhood. We sat at the bar counter which was great since all of the food preparation is done right there for patrons to watch. The menu is great for breakfast or lunch and includes a ton of delicious egg dishes, a beautiful croque madame, avocado toast, and salads including the one I had with crispy goat cheese, walnuts, and bacon. They also serve great coffee and beautiful desserts. It's a must when you're in town, and if you miss it a lot when you're back in the United States you can also visit their other (original) location in the West Village to give you a small slice of Paris. Buvette is located at 28 Rue Henry Monnier. I normally come here for lunch or an afternoon snack whenever I am in Paris. I love the bustling environment, and you can't beat the people watching along Boulevard Saint-Germain. It's great for a cheese plate, a glass of Champagne, and a recharge while shopping your way through Paris. Try for the seats outside that face the Boulevard, but I also love the semi-enclosed terrace out front which gives you the best of both worlds, especially on rainy days. Café de Flore is located at 172 Boulevard Saint-Germain. I follow a few expats on Instagram that now live in Paris (@lostncheeseland, @parisinfourmonths, and @rebeccaplotnick), and all of them seem to frequent this small café in the Bastille/Oberkampf district quite regularly. It's a tiny little coffee shop that also offers all day brunch, which is perfect for traveling Americans craving a proper breakfast. They do not take reservations, and the wait can often be substantial, but it's a really charming spot with some delicious favorites. My friend and I split a grilled cheese sandwich, and eggs in a cast iron skillet with spinach, pine nuts, and feta. The coffee is also a standout. Café Oberkampf is located at 3 Rue Neuve Popincourt. I've eaten here many times before, but it's a great spot to stop for breakfast or a coffee on the Île St-Louis. They have great croissants, omelets, cheese plates, and snacks. It's nothing fancy, but I always think it's a perfect stop on my first day in town when I'm feeling tired and need a pick me up. A classic choice for a casual daytime meal. Cafe St. Regis is located at 6 Rue Jean du Bellay. It's hard to find places in Paris that serve breakfast during the week, and Claus not only does that but is also conveniently located not far from the Louvre. You enter into a bakery atmosphere on the main floor, and diners are taken upstairs where a few tables are set for reservations. We enjoyed coffee, pastries, yogurt, granola, eggs, and bacon. A very suitable and proper meal to get the day started in Paris. Claus is located at 14 Rue Jean-Jacques Rousseau. I have written about Ellsworth many times, and after multiple visits I am still loving the food here. 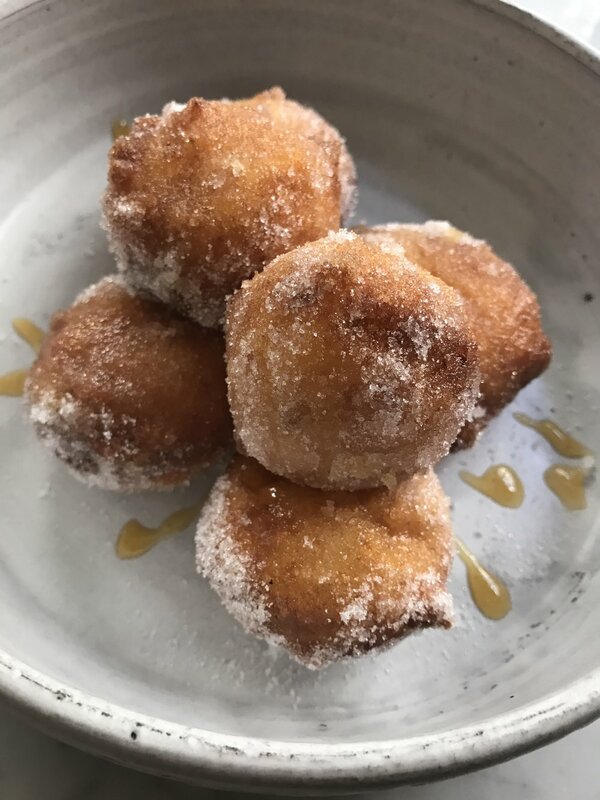 The brunch and the dinner are both excellent, and the team here does a more casual version of their first restaurant, Verjus. 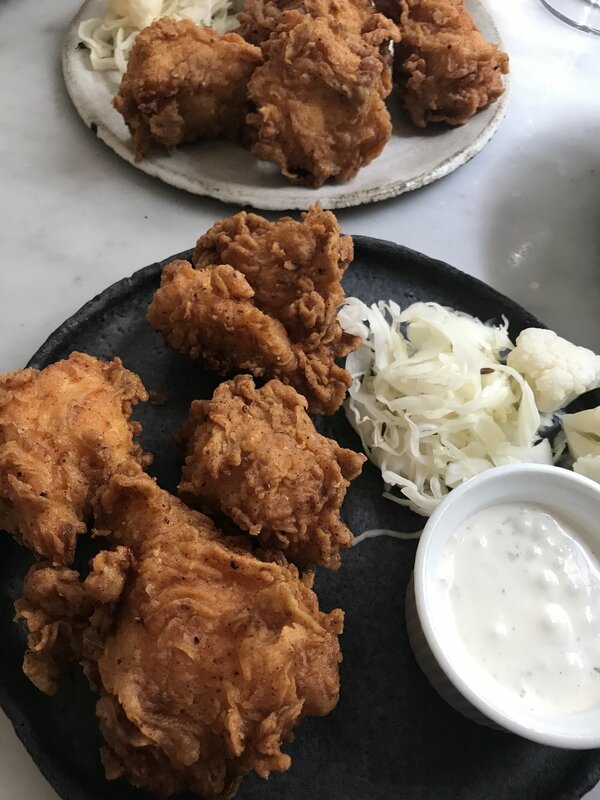 The small and shareable plates include inventive takes on American style dishes, and the fried chicken served with pickles, cabbage, and buttermilk is not to be missed. 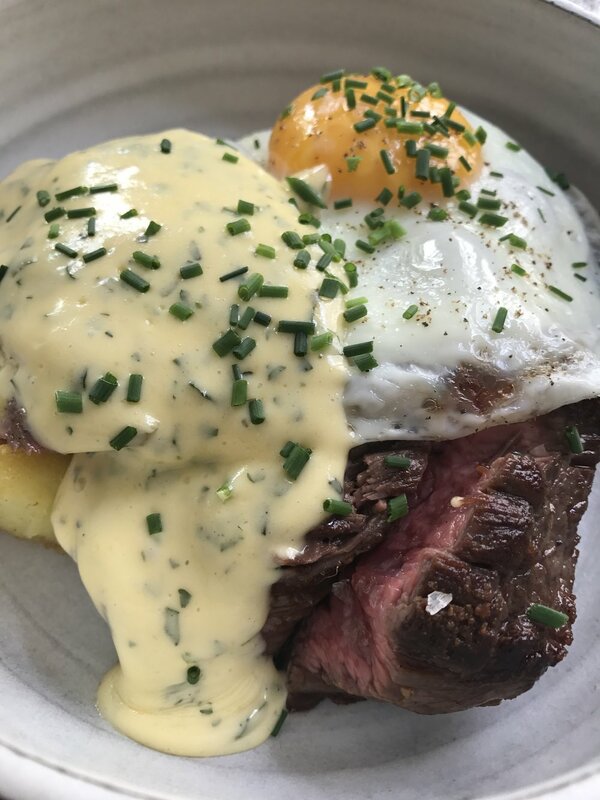 On this most recent trip we loved the ricotta doughnuts, the bavette steak with egg and potatoes, and the poached egg with oyster mushrooms and asparagus. Ellsworth never disappoints! Ellsworth is located at 34 Rue de Richelieu. This is my favorite spot in Paris for a no frills but fantastic dining experience. I also highly recommend it for a solo meal. They don't take reservations, and the place is generally packed within the first 30 minutes of opening. If you get there early, you shouldn't have a problem getting a seat. Each dish was better than the next, and some of the combinations sound straight up bizarre on paper, but they always work beautifully. For example: the burrata with chard, pomelo and a beetroot and peanut condiment. 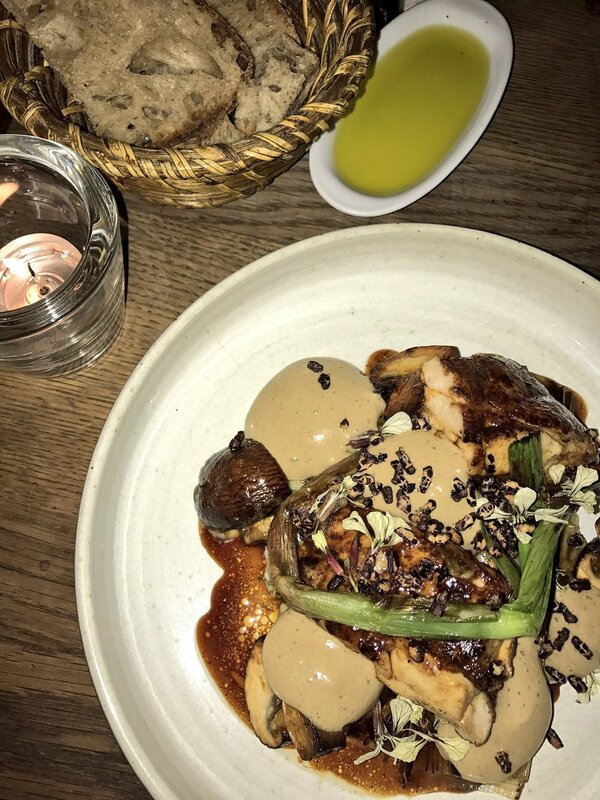 Another memorable dish was the roasted sweetbread with wild mushrooms and coffee sabayon. Whatever you do, be sure to save room for dessert! I indulged in a rhubarb tart with almond milk ice cream that was dreamy. Frenchie Bar a Vins is located at 6 Rue du Nil. I read about this sophisticated restaurant in the Marais in this Travel and Leisure article back in 2015. I immediately put it on my list as it seemed like the kind of place I would love. The entrance into the restaurant is located within a small courtyard and the interior space is stunning. It's an intimate setting with a limited amount of tables, and is a great option for a romantic evening meal. The food is upscale and well done, although I must say the meal didn't knock my socks off. I liked the lamb shoulder with black sesame sauce and thought the tagliatelle with peas and clams was well composed, but I wasn't wowed by the appetizers and the desserts sounded better than they tasted. However, it's hard to beat the ambiance of this place and I'd definitely be open to giving it another try. Grand Coeur is located at 41 Rue du Temple. Saint-Germain is my favorite neighborhood in Paris, and you cannot go there without stopping in for drinks and snacks at L'Avant Comptoir. Its a small room tucked away behind a curtain that looks like a tiny deli. It's a standing room only establishment, and each small plate on the menu is on a card hanging from the ceiling. The bar is lined with baskets of bread and huge chunks of butter. I recommend getting cheese and charcuterie and a glass (or bottle) of rosé. It's a great pre-dinner stop that draws a fun and lively crowd. L'Avant Comptoir is located at 3 Carrefour de l'Odéon. This place isn't new or exciting, and it tends to draw a bit of an over the top crowd, but for some reason I am still smitten with it. The interior is chic with plush purple velvet chairs, and the tables outside have a view of the Eiffel Tower. The continental menu includes everything from potstickers to tuna tartare, and the prices are extravagant. However, the food happens to be very good, and I always enjoy it for lunch or a snack when I'm shopping around Avenue Montaigne or near the Champs Elysses. It's also a very comfortable spot for solo dining. L'Avenue is located at 41 Avenue Montaigne. This place continues to be one of my favorite choices for a classic French bistro. It offers many traditional dishes such as duck confit, sole meunière, and roast chicken with a mushroom cream sauce. Even more charming are the red and white checkered tablecloths, and the overly friendly waitstaff. I have been here many times, and really enjoyed it again on this last visit with friends. I recommend making a reservation. Le Fontaine de Mars is located at 129 Rue Saint-Dominique. I know, I know... you're thinking why would I go for Italian food when I am in Paris? But, just go. Run to Ober Mamma as fast as you can! My friend Nikki first experienced it on her trip to Paris a few months before me, and her photos and descriptions were infectious. The restaurant is owned by Big Mamma Group and Ober Mamma is a fun and relaxed Italian trattoria in the hip Canal St. Martin neighborhood. I can't even explain the joy of this place. The entire staff is having a blast, the music is blaring, and they are there to ensure you have a fabulous night. It doesn't hurt that the food is also incredible. The eggplant parmesan, the pasta with truffles, and the rigatoni with San Marzano tomato sauce was perfect. We paired the meal with a beautiful red wine, and we just sat back and enjoyed the experience. I cannot recommend this place enough! Ober Mamma is located at 107 Boulevard Richard Lenoir. When I was doing my research for this trip, I came across a mention of a new restaurant from Chef Alain Ducasse who is one of the most famous French chefs in the world. He has restaurants all over France, but also in Doha, Tokyo, London, New York, Las Vegas, and Hong Kong. Champeaux is his newest, and is a casual brasserie in a new area at Les Halles. The restaurant is large, open, and airy, and has a very modern atmosphere including a large installation on the wall that appears to be a train schedule, but actually displays the restaurant's menu. The food was solid, but the service was mediocre. The steak frites and chocolate soufflé hit the spot, but it wasn't a knockout meal. I wouldn't put it at the top of your list. Restaurant Champeaux is located at Forum des Halles La Canopée. This is probably the best meal I have ever had in Paris. I know it's a bold statement, but this restaurant is everything. The upscale version and older sister to Ellsworth, Verjus offers a tasting menu in a small dining room with simple and sophisticated décor. The service is outstanding, and Chef Braden Perkins is always tweaking the menu to include the best seasonal ingredients. On the evening we dined at Verjus we were served oysters with rhubarb, burrata with strawberry and seed crackers, and lamb with "snails" which was code for beautifully coiled garlic bread. This meal was so captivating that I didn't take a single photo. You just have to take my word for it that it's a pretty mind blowing meal. Make sure to book this one ASAP, and the good news is that they take reservations online via their website. Verjus is located at 52 Rue de Richelieu. I was very moved by episode 3 on Chef's Table France that focused in on Chef Adeline Grattard. She is the owner of a successful restaurant, boutique, and tea house called Yam'Tcha in Paris. Her food marries the best of French cuisine with Chinese cooking, and much of this is due to her own marriage to Chi Wah Chan from Hong Kong. The takeaway window of Yam'Tcha Boutique offers savory and sweet steamed bao buns. The signature bun is stuffed with Stilton cheese and cherry, and it is divine. My friend and I got the sampler which included 5 different buns. Some featured vegetables, some pork, and we also really enjoyed the chocolate and passionfruit as a sweet treat. It's a fun stop for a snack, and it's easy to grab a bun to taste and walk with it as you continue to explore the famous Rue Saint Honore environs. Yam'Tcha Boutique is located at 4 Rue Sauval. When I visit a city for a week or longer, I like to try splitting it up by staying at two different hotels in two different locations. This gives me the chance to explore new neighborhoods, and to get different vantage points. I have two spots that have become my favorites, and I stayed at both on this most recent trip in April. A few years back my friend Julie introduced me to this charming hotel in Saint-Germain in the 6th, and I have now made it my home away from home when in Paris. 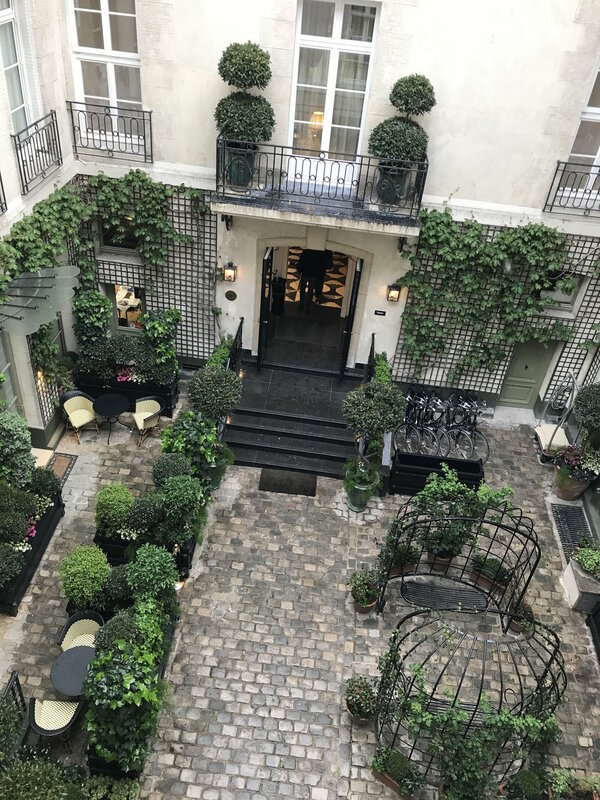 It's a small luxury boutique hotel that has all of the romantic elements of France: a magical courtyard, unique décor in each room, and a beautifully redesigned lobby that marries old world charm with newer and modern elements. All of the rooms are wonderful, but if you have the chance, I recommend splurging for one of the duplex rooms which has two floors. The Relais Christine has it all. The hotel is located at 3 Rue Christine. While I am loyal to the Relais Christine, I wanted the opportunity to spend part of the trip on the Right Bank as well to experience different parts of the city. I read about a new Starwood Design Hotel called Le Roch Hotel & Spa that was also named one of the best new boutique hotels by Conde Nast Traveler and thought it was worth exploring. The Le Roch is modern and has a gorgeous aesthetic with a color palate of turquoise, mustard, and gold. The lobby has a beautiful sitting area, a nice restaurant and a small bar, and there is also a cute outdoor patio around the back. Our room was new and offered comfortable amenities including an iPad for exploring all of the hotel offerings. I would stay here again in a heartbeat. It was fabulous. Le Roch Hotel & Spa is located at 28 Rue Saint-Roch. Have you decided to book your trip to Paris yet? Because if this hasn't convinced you, then I don't know what will. Paris is always a good idea.